Clint Hill, an English teacher at Patrick Henry High School in Roanoke, Va., says in his classrooms he often sees "kids quietly talking into their phones and asking Google or other services: Hey, how do you spell some complicated word that they don't know." But Hill, who co-hosts the education podcast Schooled Ya!, says he doesn't mind. After all, he uses a little tech help on his grammar once in a while. "I struggle with spelling, and spellcheck on my word processing has been a life saver for me," he says. "I think being able to use those technological aids is not hurting anybody. I think it's just improving our ability to use our brains for other things," Hill adds. But some experts say it's not just about learning basic math or spelling. "One of the best gifts we can give our children is doing that kind of problem-solving together," says Diane Levin, a professor of applied human development at Boston University. Levin is also the founder of the nonprofit Truce, or Teachers Resisting Unhealthy Children's Entertainment. She says it's crucial for children to learn to struggle — even just a little — with challenges. "They will use those skills that they're learning for all kinds of things that come along," Levin says. "If they are a good problem-solver they'll do better than kids who just go to a screen to get the answer." How much concern should parents have over Alexa or Siri and their children? 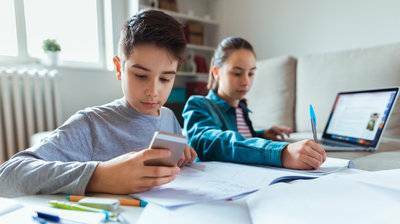 Every new wave of technology, from calculators to TV sets, elicits a panic about its effect on children, and nostalgia over the past, says Dimitri Christakis, the director of the Center for Child Health, Behavior and Development at Seattle Children's Research Institute. But he points to the TV shows we remember so fondly, like Mr. Rogers' Neighborhood. They're sweet and wholesome. And yet, a child watching television is having a completely passive experience. Because new technology is interactive, "it helps [children] understand how the world works," Christakis says. "And whereas watching television ... you play no role in the content, interacting with touch screens and for that matter interacting with these voice-activated technologies allows that to happen in spades," Christakis says. Still, he agrees that this debate is about much more than knowing what 5 minus 3 is. It's also about developing the patience to solve problems. "That ability to stay focused," he says, "particularly when something is not interesting, is one of the most important developmental skills that children acquire." In other words, it's not just about having the answers. It's about the work you put in to get them.